Completing forms has never been easier than eLock Doc’s consistent and guided form filler. Regardless of complexity or output format, all types of forms can be filled out in easily using a standard form filler from the web or a mobile device. Stop worrying about folders and save everyone in your organization valuable time. Folders create layers and layers of unnecessary structures that make files difficult to find and manage. 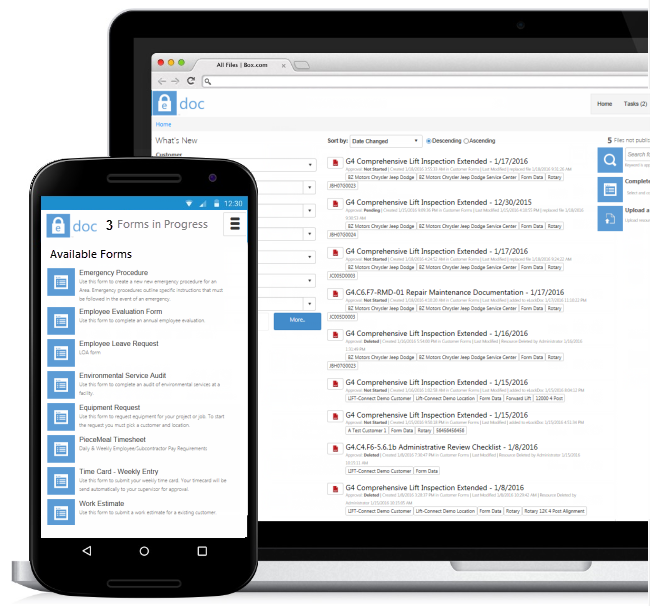 eLock Doc™ makes it easy for any user (regardless of their technical skills) to complete forms, find and store documentation critical to your business on your terms. ​If you can access the paper document why waste time finding the electronic copy? eLock Doc™ lets you get the electronic copy just by scanning it’s unique QR code to bridge the paper and electronic world. Save money on insurance premiums; A subscription to eLock Doc will pay for itself! Manage common administrative processes such as teacher evaluations, student learning objectives, instructional resource management and more.. Contact us to find out which option is best for you!